ESTROBOLED PARA MOTO EM LED 3W POWER .4 PATROL 2 FRENTE E 2 TRASEIRA. 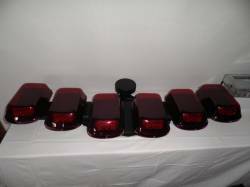 ESTROBOLED PARA MOTO EM LED 3W HI- POWER .4 PATROL 2 FRENTE E 2 TRASEIRA. GIROFLEX BARRA SINALIZADORA EM LED.